Below is the second in a series of Beijing water oral histories, as told to Wang Jian by Sun Jiaming and Sun Jiayi. Below is the second in a series of Beijing water oral histories, as told to Wang Jian by Sun Jiaming and Sun Jiayi. Download the pdf here. The Sun brothers: Jiaming, a 66-year-old engineer, and his brother Jiayi, a 57-year-old electrician. Our house was in Jiqing Xiang (Lucky Lane). 500 metres to the east was Wangfujing (Well of the Princes’ Mansions) and 200 metres to the west was Tongzi He (Pipe River). From the Ming to the Qing dynasties, about ten princely mansions were built in this location and because there was a well with very sweet water nearby, it was called Well of the Princes’ Mansions. The imperial capital had been built here for 800 years, demonstrating a great deal of sound judgment. Such an ideal spot could only have been chosen with a very good understanding of geography and astronomy! My grandfather and father held positions in the national government’s Railway Department, one after the other. When my grandfather bought this house in 1938, he got someone to come and sink a well in the courtyard. The man asked how deep it should be and my grandfather said he should just dig down to where the water was sweet. It was amazing that he dug down ten zhang (about 23 metres) all in one go. At this point he reached a sandy layer, which was the sediment from the original Yongding River. As soon as the well digger saw this type of soil, he said we would soon xi jing xi jing. We poured water into the well, all the while using the pump which had pistons to flush out the foamy sediment. After the sediment had all been drained out, the fresh water gradually started to rise. At first it was rather dirty, but as it rose, it became cleaner and cleaner, and very soon it was clear. The water had a lovely taste, so fresh and cool. (wash out the well) – a professional term meaning that the well is ready to be flushed out and that it is unnecessary to dig any deeper. We had a pump to xi jing. We poured water into the well, all the while using the pump which had pistons to flush out the foamy sediment. After the sediment had all been drained out, the fresh water gradually started to rise. At first it was rather dirty, but as it rose, it became cleaner and cleaner, and very soon it was clear. The water had a lovely taste, so fresh and cool. In those days we didn’t have a fridge, so in the summer we put some of the well water into a wooden barrel to chill watermelon, cucumber and sweet-sour plum juice. If we were worried that the milk would go off, we’d make a frame out of wire netting to hold the milk bottles, and then lower them into the barrel so the well water could chill them. In the 1940s, Beijing already had running water, but as the supply was poor, not every household had it. In order to provide tap water, the government would put well water into water towers at the new waterworks in Dongzhimen (Due East Gate). There were restrictions on how much running water people could use because at first there wasn’t much water available. But after wells were sunk in the western and southern suburbs, the ordinary people of Beijing could all start using tap water. At the end of 1948, when the Liberation Army surrounded Beijing, water and electricity in the city centre was cut off, and our running water also stopped. Water from the communal wells couldn’t be transported so all of the neighbours in our area would come over to our yard to fetch water. It was then that our water pump came into its own. It started pumping early in the morning, rested for a while at midday, and continued pumping in the afternoon, right until dark. There was always plenty of water, and it never dried up. The weather was very cold at the time, and with the courtyard totally covered in ice, the pump really got us through a tough time. There was also a well at the gate of the Yonghua (Private) Hospital, not far from the entrance to Lucky Lane. A large pool made of wood had been built next to it with gourds floating in the water. If passersby felt thirsty they could just walk over, pick up a gourd and have a drink without having to pay for it. Horse carts, donkey carts and even camels coming past laden with goods would stop to drink. Donkeys, horses, mules and camels all knew the place. They all liked walking here, even from as far as Qianmen Street (Front Gate Street). It was as if they knew there was water going for free here, that is unless you brought a water cart to get some. Then you had to pay a little. Later, during the time of the Cultural Revolution, the Yonghua Hospital was turned into cheap housing. I don’t know exactly when or how the well disappeared, but now that area has become a foot path. At one time, there was a family from Nan Chizi (South Pond) that sold water. They would be up before daybreak filling their oval water cart with water. On top of the tank there was a cork stopper and they also had a rubber hose and a pair of wooden buckets, commonly known as shuishao. They used to stop the cart in the street and use these shuishao to carry water to the householders and shopkeepers along the street. Instead of knocking at people’s doors, they just used to call out, “We’ve come to bring water.” After one water vat had been filled, if you said one wasn’t enough, they’d ask you to wait a moment and bring another load. You only had to pay a little for it. The water and the service were cheap, and because people’s water consumption was low, one vat of water was enough to last a while. People haven’t used water carefully like that since the 1960s. In the past, people were fussy about running a household frugally and were loathe to waste water, and as a result they never felt that water was in short supply. But by the 1980s, things had changed so much – sometimes the water was cut off for a time or sometimes there was only a trickle of water because the pressure was low. Now that there are water meters to calculate everyone’s water bill, some people who are especially mean put a large bucket under the tap, so that when the meter isn’t working, they collect bucket after bucket. Thinking carefully about it, Beijing has changed a great deal. After only a few decades, some wells remain but are without water and all that is left of other wells is simply a place name. Our house was only 200 metres from Gu Gong (Forbidden City), with the Tongzi He (Pipe River) running next to it. The Tongzi He had quite a few names: Jinshui He (Gold Water River), Yu He (JadeRiver) or Yu He (Emperor’s River). According to the yin-yang five elements theory, water that comes from the west belonged to the element gold, so it was called the Gold Water River. And because it flowed slowly through something similar to a jade-studded belt, it was also called the Jade Belt River. The neighbours in our vicinity all used to call it the Pipe River. The water in the Pipe River originated in the Changping area’s Baifu Quan (White Floating Spring). It went through Kunming Lake, flowed parallel to Chang He (Long River), into Shisha Hai (ShishaLake), and finally went into the Gold Water River near Tiananmen (Gate of Heavenly Peace). The Gold Water River was also divided up into the inner and outer sections. The inner Gold Water River flowed past many halls and secret passageways in the Forbidden City, with four turns in the river of 180 degrees and too many 90 degree bends to count. The most interesting thing was that the east and west banks of the river were different. The western side nearest the Forbidden City had railings made of intricately worked white marble and the eastern side consisted of a very plain, waist-high grey brick embankment with yellow ridging. At its widest part, the river was six metres wide, while the narrowest part was only a little over one metre wide. The river zigzagged continuously and ended up as a little lozenge-shaped tail. Why was it constructed like this? Experts claimed that the inner Gold Water River was a dragon! The west side was thought to be the creative yang side, while the east side was the gentle yin side, with the lozenge-shaped pattern being the dragon’s tail. There are many intriguing patterns like this in the Forbidden City. The 52-metre-wide outer Pipe River was not only the Forbidden City’s first line of defence, but could also be used to fight fires. Fires in the Forbidden City were a terrifying prospect. When the Jianfu Gong (Establishing Happiness Hall) caught fire in 1923, it was put out with water from the Pipe River. In the past, there were lotus flowers in the sections of river flowing past Tai Miao (ImperialAncestral Temple), and Sheji Tan (Gods of Soil and Grain Altar). The old man who looked after the Temple moved about the river on a little wooden punt with a shack on it. If you walked down to the riverbank, the old man used to push the boat over with his barge pole, ask if you wanted any lotus pods, and let you choose them. He would pull out the ones you asked for, tie them in a bundle with ma lian (Chinese small iris) and after he passed them over to you on the bank, you paid him a little money. In those days, you could walk right down to the water because the river didn’t have as many brick embankments as now. At one such place, you could get to the water by the pagoda tree near the corner tower. The boatman also had two baskets bolted to the side of the boat that were submerged in the water – one full of all kinds of live fish, like whitebait, crucians and little carp; the other contained little shrimps. They were very cheap to buy. He also had little snails and clams. Now there’s none left. If you go and have a look now, the northwest corner of the Pipe River is full of blue-green algae. When winter arrived, the north branch of the Pipe River froze into thick ice. We would get down onto the ice, chisel a big hole and go fishing, bundled up in our thick cotton-padded clothes. Every now and again we’d pull out a fish, flapping and bouncing, then after a while it would stop moving. Next time we’d look, it would be frozen solid on the ice! Lots of people went fishing there in winter but some went just to go skating. In those days people couldn’t afford ice skates so we used to nail a thick piece of wire onto little wooden boards and strap them on our feet to skate on. In 1954 and 1955 when the Cultural Palace opened up ice skating rinks, people who had skating boots went to skate on the ice rinks. People with no ice skates skated on the real ice of the Pipe River. In the past, people also used to come here in the winter to get blocks of ice. They chiselled into the ice with drilling rods and cut 2 metre by 3 metre blocks of ice, slid them to the edge of the river with hooked poles, and hauled them up planks onto horse-drawn carts. Cartload after cartload of ice went to the ice house outside Deshengmen (Virtue and Victory Gate) where it was stored, a layer of reeds between the layers of ice. With straw matting and then earth packed around them, those blocks of ice could last from early winter until August or September of the following year. At that time everyone in Beijing used natural ice, not like the refrigeration these days that requires electricity. Just think how much energy was saved! In the full heat of summer when my grandmother couldn’t stand it any more, she’d get me to go to the ice storage depot in Donghuamen (East Flowery Gate) to buy ice. You paid at the entrance and someone smashed the ice into little pieces, then shovelled it crunching and cracking into a bag and handed it over, not too fussy about how much you got. If you ran home as fast as you could and put it in a wooden basin in the middle of the room, it cooled everything down straightaway! The cold drinks at the Dongan Mall were also cooled down with ice chips in a wooden barrel. They had soft drinks, sweet-sour plum juice, everything! The drink bottles were in an oval wooden barrel, more than two feet high, which rested on bricks. It cost fifteen cents a bottle, which I could never afford, but I’d lean over them, staring. It sure made me greedy for some! Nan He Yan (South River) was just where you came out of Wanqing Xiang (Many Celebrations Lane). This river was connected to Changpu River and Gold Water River. With no-one looking after it, this little section of the river ended up being just a polluted ditch because everyone threw their dirty water into it. Quite a lot of people also had pigs and would take them down to the water to wash them. Every summer, the area became unbearable because of the mosquitoes, the flies and the stench. When there was a downpour, the ditch filled right up until the water was level with the surface of the road, and since people on bikes couldn’t tell what was rain-covered road and what was river, they’d sometimes fall in! In 1955, Nan He Yan was simply filled in and the ditch became a sewer with a road built on top of it. In 1958, Bei He Yan was also filled in. The earliest plan was to channel water over from Shisha Hai (Shisha Lake), but later this plan was shelved because it was considered too big a project. That’s the reason why the levels of the road and the pavement are so different in that area. The section of the river called Changpu River was water that came from the viewing platform next to Tiananmen, then flowed east past the Nan He Yan right up to the Distinguished Guests Tower. Later the river became a storage vault. During the disastrous ten years of the Cultural Revolution, lots of flags, banners, slogans, props and so on were used when Chairman Mao reviewed the Red Guards and mass rallies. All of those things had to be stored away somewhere, so the Changpu River was covered with slabs of concrete and turned into a sort of warehouse. It was left like that right up until 2003, and the slabs of concrete were only removed when the residents in the area were moved out. Then the place was turned into Changpu Park. Speaking of the Cultural Revolution, the “Big Link Up” of the Red Guards was happening at that time. Huge numbers of Red Guards thronged to Beijing, and of course it was hard to organize things properly for so many people. Neighbourhood committees made everyone help out with billeting and every family had to put up with it. Our family cleared out a room just for Red Guards. During the day the Red Guards would congregate in Tiananmen, then they’d come back at night to sleep. At the height of Mao’s personality cult some Red Guards came to Beijing just to wait until Mao came out to view the crowds. Many of them also made their way to the Pipe River to scoop up water in bottles lowered into the river on pieces of string. Why did they do this? They were under the impression that the water in the Pipe River was what Chairman Mao drank. They’d take the water back home and tell people that the water they had brought back was the water that Chairman Mao drank. Now things have changed. All the river courses are being “tidied up” and are being concreted at the drop of a hat, so they don’t have any natural charm any more. These days, the Gold Water River doesn’t flow any more, and they have built Changpu Park to the east of the Nan Chizi (South Pond) at Yinsi Gou (Silver Thread Canal). I don’t know why the water doesn’t flow any more; what was once living water has turned into stinking dead water. Although the area has been beautified, what’s the use? It was reported that there was an outbreak of blue-green algae in Tai Hu (Lake Tai) this year. When it’s hot and there’s lots of polluted water, the water in the moats in Beijing becomes black, rancid, smelly and full of algae too. Now they are getting ready for the Olympic Games and water from the Miyun Reservoir is being diverted to flush out the rivers in Beijing. I can’t imagine how much water this will waste and to tell the truth, it can’t be any sort of long-term solution! 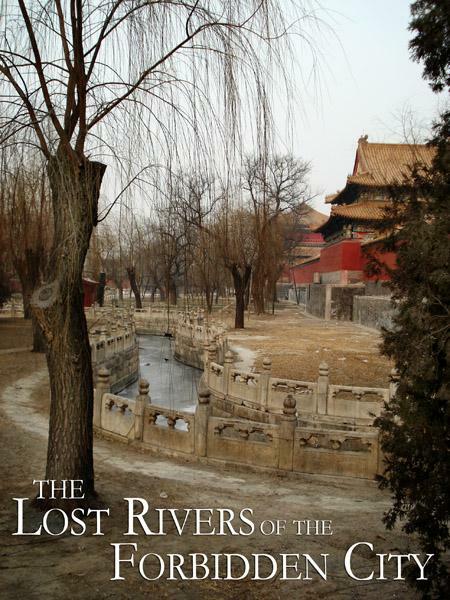 The moats outside the Forbidden City built in the Ming Dynasty are known as Tongzi He (Pipe River) by local people. They are altogether 3,300 metres long, 52-metres wide and 4.1-metres deep with a total capacity of 500,000 cubic metres of water. The moats played an important role in defending the city during the imperial era. Historically, city walls had been built around the Outer City, the Inner City, the Imperial City and the Forbidden City. Four sets of moats also helped to provide impregnable fortification for the whole city. The moats had also been used for transportation before the Qing Dynasty. When the Ming emperors decided to make Beijing their capital, a vast amount of timber was needed to build their grand palaces. Forests in the local Xishan area (Western Hills) were the source of building materials at first. However, after years of deforestation, local supply could not meet the demand of the expanding city any more. Most of the large pieces of timber then had to be floated on the Grand Canal all the way to Beijing from the upper reaches of the Yangtze River. Most of the grain and military supplies needed by the capital were also transported by water from southern China. The original layout of the Ming Dynasty moat system was preserved by the Qing Dynasty. In the summer, barges carrying goods travelled on the water and in the winter, the iced surface provided a cheap means of transportation. Previously, the water in Tongzi He was running water of a high quality. It originated in the Jade Spring in the Xishan area (Western Hills) and was reserved for the use of the imperial court in the Forbidden City. The Tongzi He was linked to the rivers and lakes in the city. Guo Shoujing, the famous hydraulic engineer of the Yuan Dynasty, diverted water from ten or more springs outside the city, such as the Baifu Quan (White Floating Spring) in Changping County; thereby increasing the flow of water in Beijing’s rivers and making water transportation possible. But in the last few decades, Beijing has undergone a severe water shortage. The springs at Yuquan Shan (Jade Spring Hill) have all dried out and can no longer supply the rivers, lakes and scenic spots of Beijing with water. Nowadays, the water in Beijing’s moats comes from the Miyun Reservoir, with the water flow being manually regulated. In order to save water, many sections of the city’s rivers have been truncated. As a result, running water has become dead water and the quality of the water has seriously deteriorated. Before tap water came into use in 1910, most of the 11 million people in Beijing lived on well water. There were 1,258 wells in the city and many hutong (typical Beijing laneways) were named after their wells, such as Wangfujing (Well of the Princes’ Mansions). The Sun brothers lived near Donghuamen (East Flowery Gate) and the top quality water from the well in their courtyard probably originated in the same place as the water in the Well of the Princes’ Mansions. Beijing, once famous for its sweet spring water and clear-flowing rivers is now infamous for its polluted canals and dried up riverbeds. My Home and Water: A People’s Account provides a rare uncensored glimpse of life and water in the ancient capital of Beijing and surrounding areas – as told by longtime residents. People were likely afraid of venturing too far from home given the tense civil war situation. The “road” is designed for vehicles and pedestrians, whereas the “pavement” is designed for pedestrians only. In the beginning of the Cultural Revolution, the Red Guards nationwide were permitted, even encouraged, to travel anywhere in the country free of charge in order to see Chairman Mao and by so congregating, contribute to the furor to launch the Cultural Revolution. The policy, needless to say, created chaos, especially for the railway system. See http://www.eorc.jaxa.jp/en/imgdata/topics/2007/tp070328.html for a satellite map of the moats of Beijing.